KANSAS CITY, Mo. — Whether you fly, drive or take the streetcar, projects totaling billions of dollars are on the way for Kansas City. Local leaders have an expensive Christmas list for Uncle Sam to bring plans to fruition. 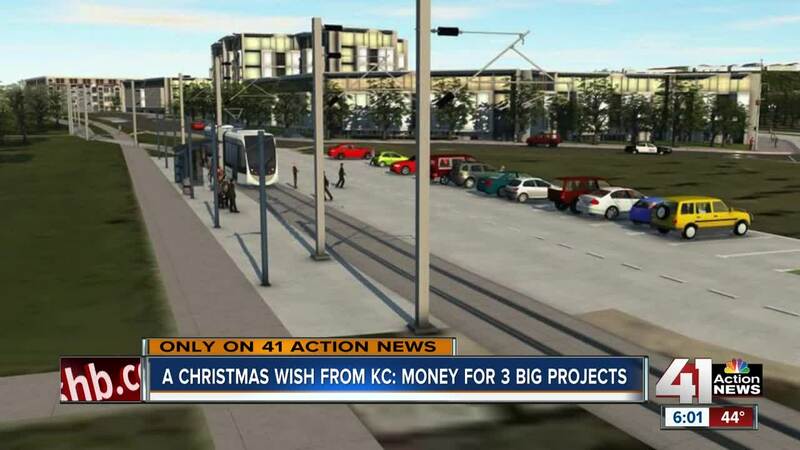 If Santa Claus lives in D.C., the Kansas City Streetcar Authority is asking for $151 million this Christmas. That would cover nearly half of the $316 million project. "We've received some preliminary feedback from the FTA in which they think it looks pretty good and we're rating pretty high," said KC Streetcar Authority Communications Director Donna Mandelbaum. Voters have already approved a local funding mechanism for the extension. In June, they passed a one percent sales tax and special assessments within the transportation development district (TDD) created along Main Street. The streetcar authority is expected to hear back on the federal funds early next year. In the meantime, an expansion in the opposite direction hit a small snag this month. The Riverfront Extension lost out on a $25 million BUILD grant, which two other local projects secured. Port KC President & CEO Jon Stephens said they were prepared for that result and had already begun looking at other options. Port KC is working on a funding mechanism based on real estate development, and Stephens hopes the request for proposal will go out by late spring of 2019. A plan to replace the Buck O'Neil Bridge got a $25 million boost from the federal government. Replacing the aging bridge will come at an estimated cost of $200 million, which is to be split by the city and the state. The city secured $40 million in federal funds through the Mid American Regional Council, and it is authorized to spend up to $60 million from the capital improvements sales tax. MoDOT identified $50 million that was initially going to be used for repairs on the bridge. Then, in early December, the project received a $25 million boost from the feds in the form of the aforementioned BUILD grant. KCMO City Manager Troy Schulte explained the federal government pays attention to which projects local leaders deem most important at the time. "We'd love to get the streetcar north extension done tomorrow, but our number one priority is to deal with 45,000 cars a day getting across that bridge," he said. The city plans to look for more opportunities for state and federal funding to complete the project. While the streetcar and the bridge are major priorities for Schulte, he's also working with the Department of Transportation on the city's biggest project. "We might be the first airport in the country to use TIFIA to help finance the terminal, which is a great way to lower the cost to our fliers who are going to pay the bills," Schulte said. TIFIA stands for a mouthful: The Transportation Infrastructure Finance and Innovation Act. It typically provides low interest loans for states and cities to finance road improvement projects. However, Schulte said the federal government approached the city with an idea to use TIFIA for the new terminal. Kansas City would be able to borrow $400 million at a 2 percent interest rate, compared to the 3.5 or 4 percent market rate. Of course it would be the airlines paying that back over time. "In D.C. people are aware of what's going on in Kansas City, and they want to help. So my sense is, we're just starting," Schulte said. Both Mandelbaum and Schulte agreed one of the most important factors in securing federal funding is having local monetary support already identified.